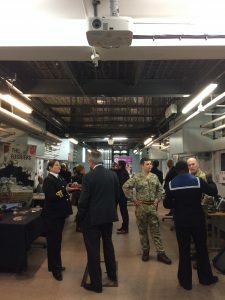 Over fifty regional employers and representatives from the Armed Forces were invited to take a special behind the scenes tour of Birmingham’s famous Steelhouse Lane Lock-up. The event was hosted by the West Midland Reserve Forces & Cadets Association’s (RFCA) Employer Engagement team as an opportunity to thank those organisations who have gone the extra mile to support our Armed Forces community. Colonel Maybery, Chief Executive for West Midland RFCA warmly welcomed guests to the event, and Phil Sinclair, Regional Employment Engagement Director for the West Midlands gave a small speech to thank employers for their ongoing support and highlighted how they can continue to develop their commitments. As well as having the opportunity to meet with our Employer Engagement team and regional Armed Forces representatives, guests were treated to a fascinating talk about the history of the Lock-up by Corinne Brazier, Subject Matter Expert for Heritage Projects at West Midlands Police. 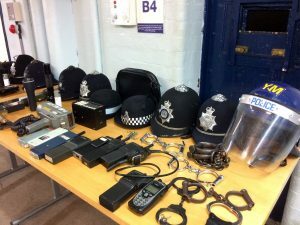 Employers were also given the chance to tour the cells at leisure, hear stories about individual officers and prisoners and learn more about how about crime and punishment has evolved over time. The employers in attendance were those who have attained either a Bronze, Silver or Gold Award in the Employer Recognition Scheme. Phil Sinclair commented: ‘It was a huge pleasure to be able to host some of our most supportive employers and partners at the fabulous Steelhouse Lane Lock-up venue. The event was a regional part of the wider Menu of Benefits Scheme which aims to recognise and reward those organisations who have demonstrated their support at Bronze, Silver or Gold level. A gallery of photographs from the evening can be found here.